Lots of action over the past week and lots coming up over the next week. Check out this week’s bumper edition and click on the links to follow Eagles Alumni games this week. Pepperdine had a mixed last week. First up they had a great win over UC Riverside 70-59 before they going down in a close one 71-78. Meads had 6 points and 4 rebounds in 15 minutes in the loss to Long Beach. 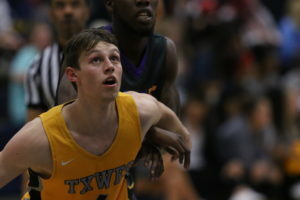 Texas Wesleyan had a good 77-73 win over the University of Science and Arts. Sam had 6 points, 5 assists, 3 rebounds and a block in 37 minutes. The team now take on Mid America Christian University. 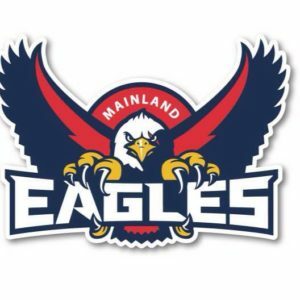 Alaska Fairbanks had a loss to Alaska Anchorage 56-88 last week. 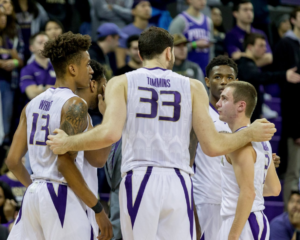 This week they play Multnomah University twice in two days and will be looking to steal two wins. Washington has had a good few weeks. First the knocked of number 2 ranked Kansas 74-65. Sam had 8 points, 3 rebounds in the win. Unfortunately the good run came to a end with the team losing 70-97 to Gonzaga, The team now have two games in two days both which they will be looking to win to get back rolling before christmas. Whitworth are currently ranked 7th in Division 3 Men’s basketball. They have continued there good run in the last week with a 85-73 win over Colorado College. Sam added 10 points, 3 rebounds and 2 steals in 25 minutes. The 7th ranked team now have one more game before a 10 day break over Christmas. 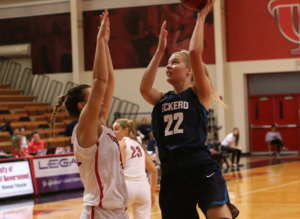 Eckerd College have had a great start to the season with a 9-1 record. Last week they added two more good wins to this record. First up they beat Palm Beach Atlantic University 68-44. Zoe had 7 points, 6 rebounds and 2 assists in the win. Then the team beat Christian Brothers University winning 67-50. Zoe had another game scoring 8 points and grabbing 8 rebounds. The team continue their busy schedule with 2 more games coming up. Hayden started his first game for Laramie County over the past week. They had a tough battle against Northwest Kansas Technical College losing 65-77. Hayden had 2 points and 6 rebounds in the loss. They team has a busy weekend ahead playing Snow College and The College of Southern Idaho. 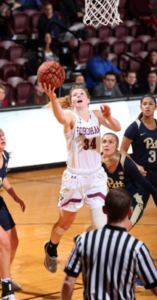 Fordham University have had a good run of late, First up last week a great with over Iona 78-48. Mary had 11 points 3 rebounds in 29 minutes. Then the team had a huge double overtime win over St Johns 67-64. 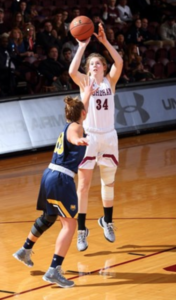 Mary played a massive 50 minutes where she filled the stat sheet scoring 12 points, grabbing 10 rebounds to go with 7 assists. The team now have two upcoming games before christmas playing Bucknell and UCLA. Last week the Southeast CC team had a mixed weekend. First up they had a good win over Fort Scott Community College 70-60. Shou had 8 points, 4 rebounds and 4 assists in the win, In the second match the team battled against Highland Community college going down 68-94. The team now play Southwestern Community College away from home before having a large break until January 6th. Southern New Hampshire sit at 7-4 with one game to go before a 2 week break. 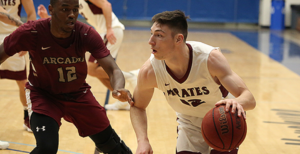 They had a good bounce back win over Concordia on Thursday 66-53 after losing to Stonehill in the weekend before. Cal State Northridge’s good formed continued last week with a 75-68 win over Loyola Marymount. The team now play two home games before the Christmas break against Northern Arizona and Omaha. After a bumpy start Casper College have put together a tidy 10-4 record. In their last game they dismantled Eastern Wyoming college 100-64. They play Northeastern Junior College today before having a break to January the 8th. They will want to go in 11-4 with momentum. Eastern Arizona College sit at 6-6 on the season and are now on a break to January 3rd. They will be looking to improve after losing 6 of the last 7. In their last game against Pima they lost 77-87. Joe had 11 points and 5 rebounds.